Outsource partnerships are perfect for organizations with needs that exceed current resources. Benefits include accessing specialized talent, increasing organizational capacity and staffing flexibility, among many others. It can potentially reduce staffing costs, too. As a specialized vendor resource for associations and nonprofits, we can jump in and collaborate with internal teams to provide a wide range of creative services. We can fill in for a designer who suddenly gets the flu or is on maternity leave. Better yet, we can develop long-term relationships where we become more like a team member. This type of team-like collaboration allows us to get to know your organization over time, enabling us to deliver even more targeted and engaging materials. We’ve also been known to toss in some small freebies along the way to express our gratitude (see “Love Never Gives Up” on our blog). 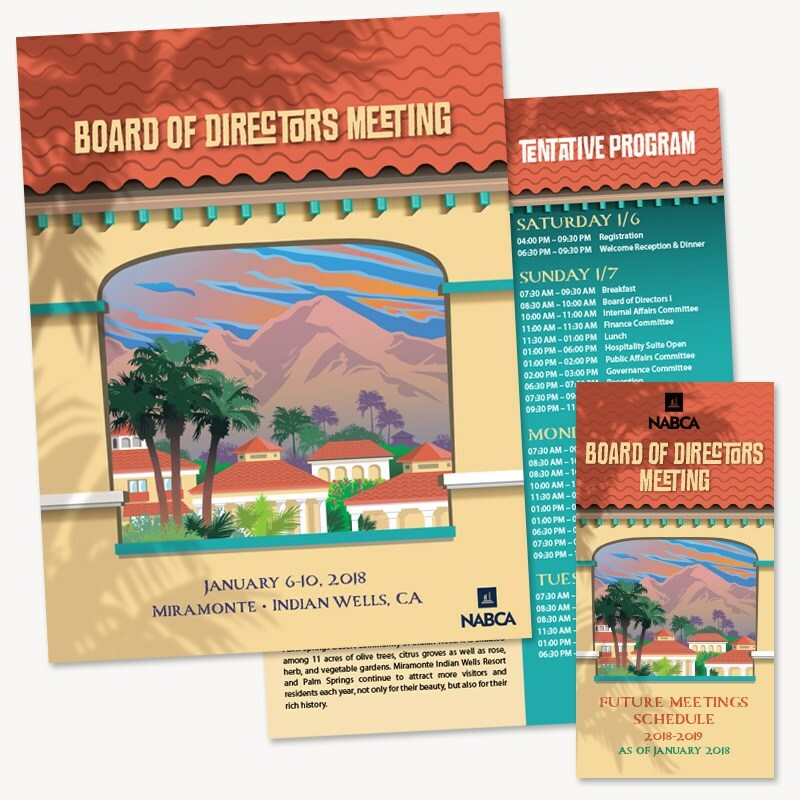 For their January 2018 board meeting, NABCA wanted the creative direction of the collateral material to reflect the beautiful, warm location at the Miramonte Indian Wells Resort. Below are the initial concepts we provided to show how we could approach the custom artwork for this event. They loved the idea of an arch wall with a view of the distant mountains. We tightened up that concept and applied color so they could get a more complete look and feel of the finished art before digitizing (shown below). The subtle palm tree drop shadow overlaying on the wall adds depth and interest to the overall concept and was the direction they approved. The final art is used on a variety of event materials, which ties them all together as one cohesive package. 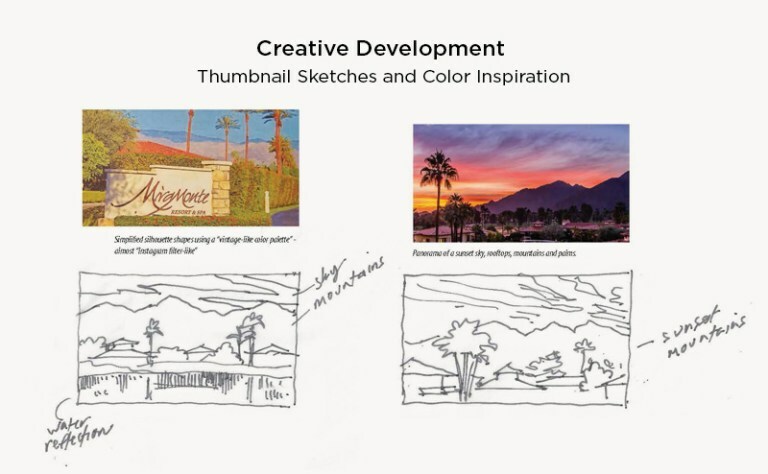 Elements of the artwork are then used in various ways across event collateral. 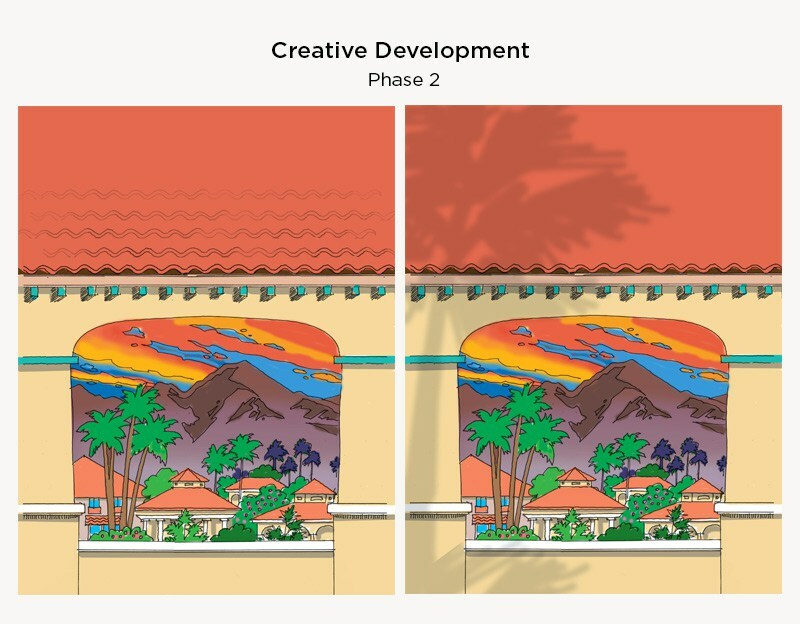 For this concept, the tile roof was a favored element that lent itself well to textured backgrounds for headlines!